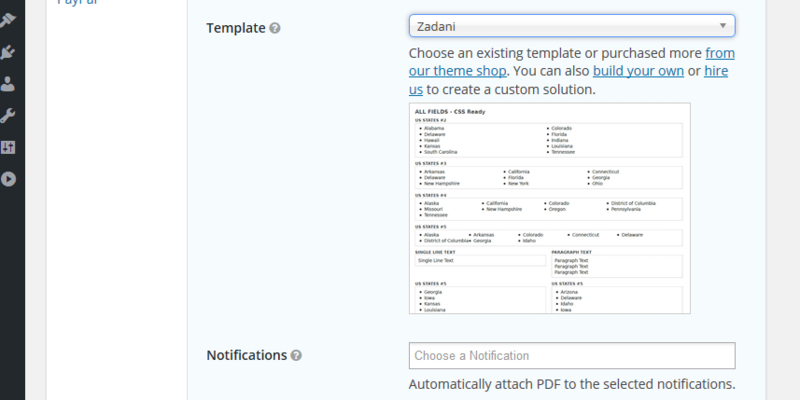 Gravity PDF allows users to set template-specific options when they configure a Gravity Forms PDF. The template configuration is used to register settings that give the end user greater control over the PDF output. You can also include an image preview of your PDF layout, which gives users a nice visual look at the template they have selected. It’s worth noting that both the template configuration file and PDF preview image are optional. They are not required when building custom templates, but do enhance the user experience. 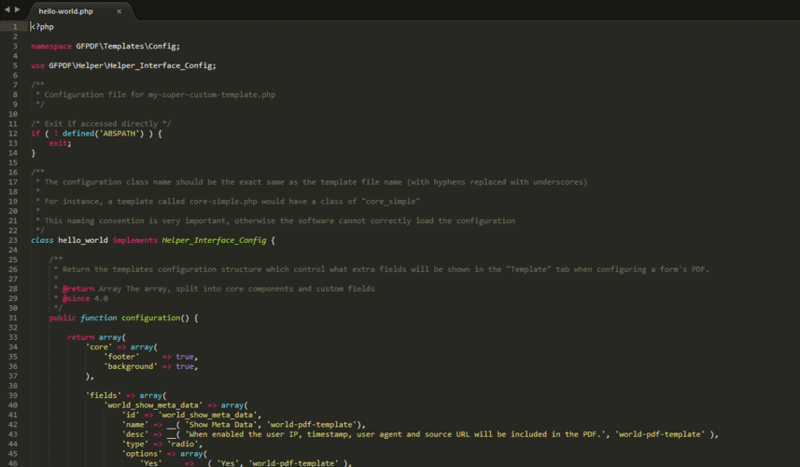 Template configuration is done in PHP files located in the config folder inside your PDF working directory. These PHP files use namespaces and contain a class which must implement our Helper_Interface_Config class (see PHP Interfaces). It’s also important to correctly name your class and configuration file so it gets auto-loaded by Gravity PDF. It sounds complex at first but with guidance you’ll find it’s surprisingly simple and powerful to use. Your PHP configuration file should have the same name as your PDF template file. If your template is called my-super-custom-template.php then that’s what your configuration file will be called (just in the config directory). The actual PHP configuration structure is straightforward, but we recommend you base your template off one of the existing configuration files – just duplicate and rename the file as per the Configuration Naming Convention above. * For instance, a template called core-simple.php or core_simple.php would have a configuration class of "Core_Simple"
* Return the templates configuration structure which control what extra fields will be shown in the "Template" tab when configuring a form's PDF. The important part of the above sample is our configuration method inside the class. This array will tell Gravity PDF about the custom template fields that it supports. The array is split into two sub-keys: core and fields. The core key allows you to enable built-in fields like headers and footers, while the fields key allows you to implement your own fields using our settings API. Gravity PDF has a number of built-in template-specific fields you can easily enable. Some of them are only applicable when using the $pdf->process_html_structure() method in your custom template, while others can be included in your PDF automatically. As you can see it’s a simple associative array which sets our core fields to true. If you saved your configuration file and viewed the Template tab you’ll see a number of new settings. Adds a Yes/No field to the template section asking users if they want to shows the Gravity Form title at the beginning of the PDF template. Only applicable when template is using $pdf->process_html_structure() in your PDF template. Although you can add your own field logic based on this setting. See custom field support for more details. Adds a Yes/No field to the template section asking users if they want to show Gravity Form page names in the appropriate location within the PDF. Only applicable when template is using $pdf->process_html_structure() in your PDF template. Adds a Yes/No field to the template section asking users if they want to show Gravity Form HTML fields in the PDF. Adds a Yes/No field to the template section asking users if they want to show Section break content in the PDF. Adds a Yes/No field to the template section asking users if they want to show fields that haven’t been filled in by the user. Unless you use @page to set your own header, the core header will automatically be included in your PDF. Unless you use @page to set your own footer, the core footer will automatically be included in your PDF. Adds a colour picker to the template section allowing users to change the PDF background colour. Unless you use @page to set your own background(-color), the background colour will automatically be included in your PDF. Unless you use @page to set your own background(-image), the background image will automatically be included in your PDF. Adding your own custom fields is where this feature gets really powerful. Using the fields sub-key you can define text, paragraph, rich text, radio buttons, select boxes, colour pickers or upload fields with a few lines of code. It’s important to use a unique name for the ID (we recommend prefixing them) and ensure your ID and field array key match. The field ID. This should be unique and we recommend prefixing it. The field label displayed to the user. The field type. Acceptable values include: text, number, checkbox, multicheck, radio, select, textarea, password, rich_editor, upload, color, button, descriptive_text, hook. The field description. This will be displayed right below the field. An array of options for use in multicheck, radio, select. The standard value that should be defined when a user hasn’t set anything. Add class name to field. Because only certain options apply to certain fields this isn’t an exhaustive list of available attributes, but they are the most common. For more details we recommend you review the /src/helper/Helper_Options_Fields.php files for samples showing you different field types. You can also see what attributes are supported by a specific field type by reviewing the /src/helper/Helper_Options.php – from line 1400 onwards. The header, first_header, footer, first_footer, background_color and background_image core fields are automatically supported in custom PDF templates (provided you don’t override them with your own header/footer or background using @page). However, all custom fields will need appropriate logic included in your PDF template. To do this, you’ll have to access a variable named $settings in the PDF template. This variable is an array that contains all the settings a user has defined (using the field ID as the array key) and is where your template settings will be located. Let’s have a look at supporting our prefix_border_colour custom field we defined above. First we need to get the prefix_border_colour setting from the $settings array. This container will have a user-defined border colour. Continuing on from our Part 3 Hello World Tutorial, we’re going to show you how to create a template configuration with core footer and background image support enabled. We’ll also add a new field that will determine if meta data should be included in the document. First, let’s grab a copy of the basic PDF template PHP mark-up and save it in the config folder of our PDF working directory. Remember to save the file as hello-world.php – the same name we used for our template file. This sample code already has the class name changed to Hello_World, but you would normally update this to match your template’s file name. The core fields can easily be enabled by passing their name as the array key with a true value. We’ve just told the system we want to enable the footer field and our background image field. If you edit your Hello World PDF settings in WordPress, you’ll see a new Template tab with our two core fields included. The system will automatically parse and store these fields when the PDF settings are saved. We’ve just told Gravity PDF about a new radio field called Show Meta Data that has Yes/No options. By default the No value will be selected and a nice description about what the field does is shown just below the radio buttons. We’ve also prefixed our field ID with world_ so we don’t clash with any other fields. And because we are conscientious developers we’ve made all our strings translatable by wrapping them in the __() function. Make sure you only translate the option array’s value and not the keys. Read more about the specifics of each field attribute. If you go back to the Template tab you’ll now see our two core fields and the Show Meta Data field. Go ahead and enable/fill in information for each field then save it. Download the completed configuration template for our Hello World PDF. Now we’re capturing and saving the footer, background image and meta data toggle from the user we need to update our original Hello World PDF template. 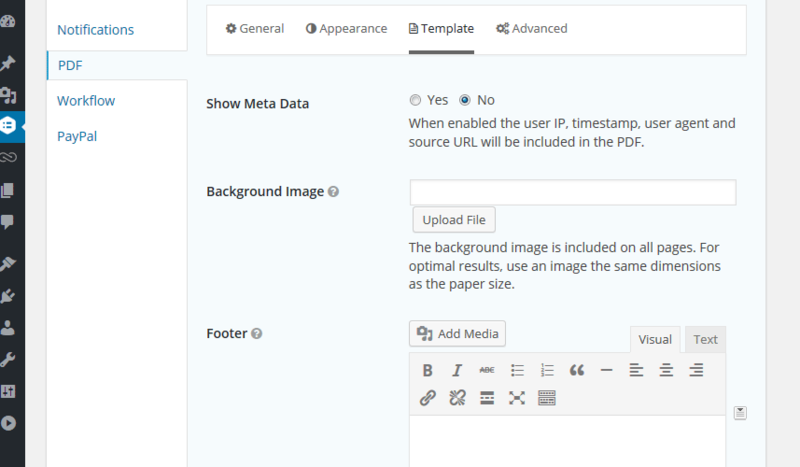 The core header/footer and background image fields will automatically be included, but we’ll need to update the PDF template to support our custom field. If you haven’t been following along with the other tutorials you can download the current PDF template here. If you remember from earlier the $settings array holds all our custom fields and is where we’ll found out meta data setting. To keep our PDF template clean we’ll set the settings variables at the beginning of the template (before the HTML). If you’ve enabled the View Meta Data option, when you view the Hello World PDF you’ll see the meta data included. That’s all there is to it. You’ve now added support for all three template-specific fields to the Hello World PDF. Download the completed Hello World PDF Template for Part 4. When a user selects a PDF template to use from the admin area they’ll see a preview of that template if it exists. To add support for your custom PDF template just save a 768×576 PNG to the images folder in the PDF working directory. Ensure you use the same name as your custom template when saving the image. For example, an image for our hello-world.php template would be named hello-world.png. These can be very useful to update PDF configuration settings when installed, and then clean up those modifications when deleted. It’s worth noting that you need to implement the Helper_Interface_Setup_Teardown interface AND both setUp and tearDown methods otherwise the correct method will NOT be run. To create a PDF template .zip package for installation just zip up your PDF template file in the root of the zip archive. If you’ve created a configuration or image file include them in their correct directories (config or images).